Tamara picked this pendant as one of her Staff Picks for Valentine's Day because it's simple yet unusual. Tamara says: "I like the clear, sweet message that this pendant sends. It's a lovely way to simply tell someone that they hold the key to your heart." 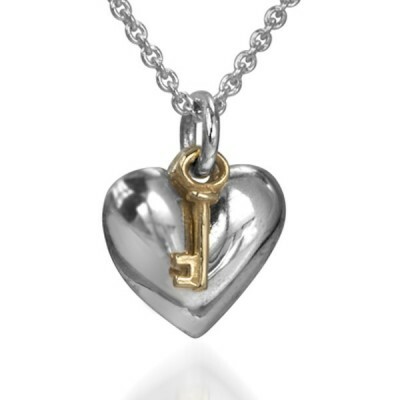 This necklace is available in various gold and silver combinations of hearts and keys. Please contact us if you'd like us to make it in a different metal combination. The heart pendant is approximately 13 mm wide, and the key is approximately 10 mm long.